When you sit down to your turkey dinner this week (next to your sick uncle Sid) don’t forget to load up on that cranberry sauce*. According to new research, cranberries pack quite the punch. They help fight disease and infections including strep and E. coli. The tangy little berry also contains antioxidants that may help protect against heart disease and cancer, and they’re also loaded with vitamin C and fiber. And don’t forget they’re also a low-calorie food! And if you have any doubts, just visit the Wisconsin State Cranberry Growers Association. I don’t know why. Wisconsin just sounds trustworthy. 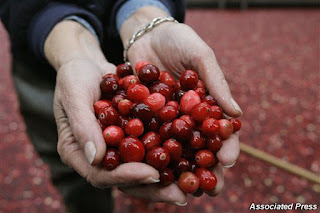 What’s you’re favorite cranberry recipe? * or a Cape Coder … I think that still counts. This entry was posted by kate, on Monday, November 23, 2009. You can leave your response .